Swimming was something I learned to do very early in life. Since my family lived near the beach it was only natural to swim in the ocean as well as in our neighborhood pool. When I was growing up and would watch The Undersea World of Jacques Cousteau, Diver Dan or Sea Hunt, it did not occur to me that I would one day be able to explore the ocean from within and not just from above. But I always wondered about learning to dive. Then I moved to Boca Raton two years ago and the time was right. A friend who was a long time diver suggested that I go to a SCUBA shop and talk to the people whose business it is to teach new divers and to support seasoned divers. I decided to take my friends advice and visit the shop offering the discount. I had a very nice conversation with the owner who explained what certification entailed and pretty much what to expect. I also asked about SCUBA equipment. All gear would be included in the price of the class, except for mask, fins and snorkel. He assured me that he had decades of experience and was very encouraging. I left the shop that day thinking that I would soon take the plunge and sign up for the class. After thinking about it for way too long I redeemed the coupon and started the SDI e-learning course. I took it seriously, reading and re-reading the information, taking notes, and taking the knowledge based quizzes. Then it was time to go in to the classroom to review the information and prepare for pool classes. Pool classes were straightforward and skill based. I learned to assemble my “SCUBA unit” and how to breathe through the regulator. I learned how to descend and how to ascend using our BCD’s inflate/deflate valve. I learned about weights and buoyancy and how the chlorinated water would be different from the ocean salt. I learned how to clear my mask from flooding, how to remove my mask underwater and replace it. There were many skills that I needed to learn before going into the ocean – the buddy system, how to tow a tired diver, how to relieve a leg cramp. Once the instructor had taught and reviewed all required skills it was time to head to the ocean on my first boat dive. Four dives were required with checklists of skills to perform. I learned that the dive begins long before you reach the boat. There was gear to pick up at the shop and air tanks to load in my car. When I arrived at the boat there were waivers to sign before the gear could be brought aboard and assembled. At first it was overwhelming, but in addition to my instructor there was a dive master and crew on the boat to help get it all together. After a briefing from the crew and encouragement from my instructor it was finally time to enter the water with my first giant stride off of the boat. And then my first descent followed. The basics of breathing through the regulator and managing the air in my BCD was checked and put into practice. Skills and hand signals were employed, and in what seemed like a mere moment, it was time for my first safety stop and ascent to the surface. Nothing seemed easy that day, but boy was it fun! On that first dive and on every dive I have made since that day I have learned something new. That is one of the wonders of diving. There is so much to see below the surface, but getting down there and back requires careful planning and learning to manage all of the gear that will keep you safe. SCUBA requires people to do something that we were never meant to do – breathe underwater. It is a remarkable thing that we can do this, but it is something to never take lightly. Safety first. Sixty-five dives later I am still learning something new on every dive, but not from my first instructors. I had experiences with them while diving that compelled me to move on. Do your research and read reviews (Trip Advisor and Yelp) on different dive shops and operations. Ask people you know who already dive for their recommendation. Interview Instructors prior to hiring them. Remember that they are working for you! Ask them how long they have been diving and how long they have been teaching. See if they can give you referrals from their students. Be wary of discounts. What I have learned is that sometimes a discount is just a discount, sometimes a discount indicates a need for business! Listen to your gut and choose wisely. Learn about the different SCUBA organizations. PADI, SDI, SSI, NAUI are just a few of the organizations that you might find in South Florida. Wikipedia has an extensive list for recreational diving and technical diving. Ask questions and keep your dive log up to date. Dive masters, boat crew, and fellow divers are a great source of information. There is much opportunity to learn while on the dive boat heading out and back from dive sites. Divers love to share their stories and give advice. Just be sure you listen to the right ones who know what they are talking about! Take more certification classes! There is always something new to learn! Jan is a student of Nick Casper at Force-E Boca and is working on her Master Scuba Diver certification. 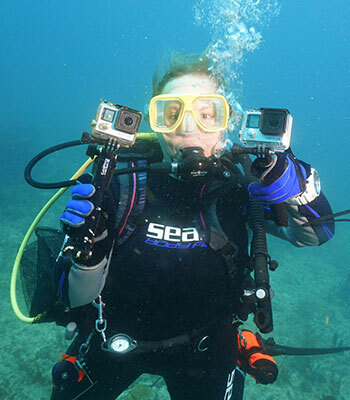 She has completed her Open Water, Nitrox Certification, Advanced SCUBA Diver, Deep Diver and Wreck Diver certifications. She is currently working on her Emergency First Response and Rescue Diver Certification.